For instance, this year we sponsored an award at the regional Kennedy Center American College Theatre Festivals (KCACTF). At each of these eight regional festivals, students could participate in workshops, discussions, regional-level scholarships, and award programs. The awards programs allowed students to present their best productions and receive feedback from professionals. We gave our award based on design excellence, efficiency, innovation, and visual presentation techniques. The eight winners, Haley Rigsby, Aiden Mitchell, Emily Kennebeck, Casey Linda Dubrowski, MacKenzie Ulibarri, Liam Home, Olivia Fuentes, and Ashley Rauras, each walked away with a new professional license of Vectorworks Spotlight 2019. These up-and-coming professionals are proof that a great project can become more than just an ‘A’ on your transcript. 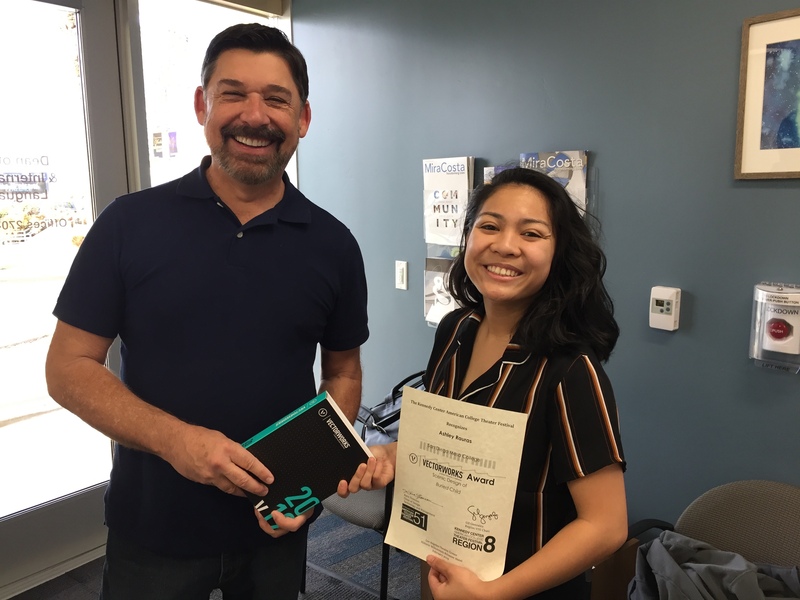 KCACTF Region VIII Vice-Chair Eric Bishop with Vectorworks winner, Ashley Rauras from San Diego Mesa College. Are you ready to kickstart your professional career? Read on to discover three ways to take advantage of your years as a student. It’s well-known that most students are on a tight budget — which is why some of the best ways to prepare for your career occur while you’re still in school. Students often receive discounts or even free access to helpful resources. For instance, we offer free educational licenses to students and professors, as well as discounted software for recent graduates. Search out the top organizations for your industry and see if they offer a student discount. 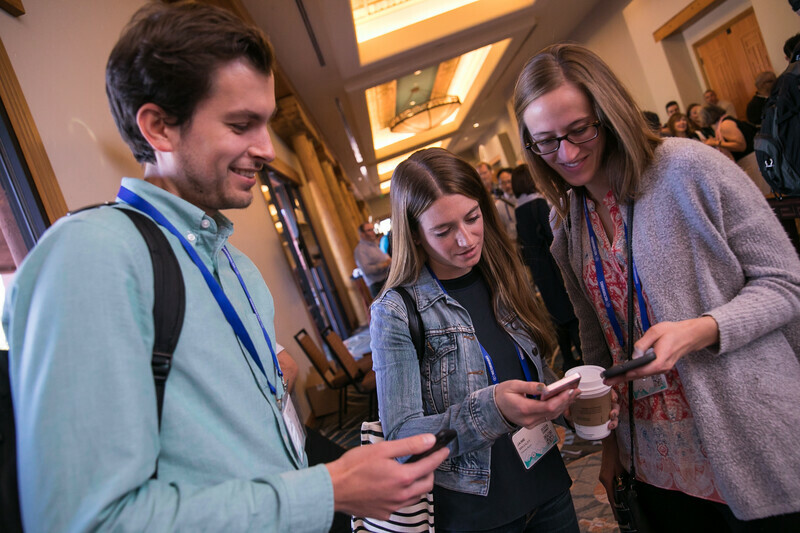 Look into popular conferences and tradeshows, which often offer registration deals for students (you can see which ones we attend here). Make sure you take advantage of these opportunities while you can. You’ll thank yourself when you graduate. See what other resources we have for students here. As a student, why should you care about attending conferences and joining professional organizations? Easy: because building your network is one of the best ways to prep for your future. As Morgan Lindsey Price, set designer and assistant art director for the popular Netflix series Glow, demonstrated in a recent interview: contacts can lead to your next opportunity. She got the Netflix job after a friend texted her about the opportunity. Though they can be beneficial, you don’t have to rely solely on official networking events. As a whole, your school years are the perfect time to meet new people. You’re surrounded in class by individuals with common interests, and you have the opportunity to meet many more through internships, professor connections, and alumni networks. You never know what you might learn or gain from a relationship, so don’t be afraid to strike up a conversation. Price actually kicked off her career when a professor introduced her to Vectorworks. The network you build today can dictate your future, leading to experiences that will build both your portfolio and your professional reputation. As you make these connections, be sure to set up your LinkedIn account or collect business cards. Your network is only beneficial if you actively build and cultivate it. You can find other tips for building your network here. It can be easy to brush off applying for awards and scholarships, but don’t. Like our KCACTF winners, you could find yourself benefiting in more ways than one. An award can bolster both your resume and portfolio, scholarships can help offset the cost of higher education, and competitions could result in other benefits (like tools and software you’ll need as a young professional). 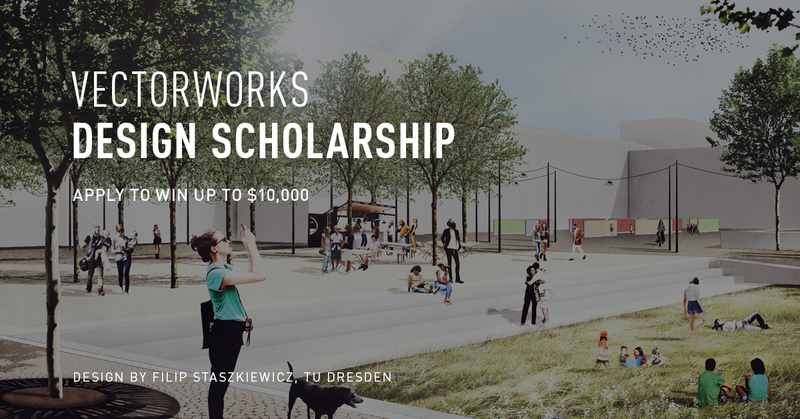 If you haven’t already, be sure to check out the Vectorworks Design Scholarship. All you need to do is submit a project, which can be repurposed from one of your classes, and write a short essay. The prizes include professional recognition, free software for you and your school, and up to $10,000 USD. Organizations, such as AIAS and ASLA, often list available scholarships for their specific industries. Be sure to check with your school for scholarships, too. Interested in jumpstarting youR career? Check out the Vectorworks Design Scholarship.